When Joe was in first grade, he had everyone in class convinced that he had a pet "cat and mouse". What no one at school realized was that the cat and mouse were stuffed animals which he kept under a laundry basket which he called their "cage". When I talked to his teacher a few weeks after school started she asked me about BJ and Charlie -- yep, he had even named the stuffed animals. Of course what Mrs. B was most interested in was the pet "mouse". She thought he might be a hamster or a gerbil. And that was how we found out about Joe's almost frantic desire to have a pet. Unfortunately, DH is allergic to cats and dogs. When he was tested, it was determined that we could have a pet bird (which we tried briefly before kids -- too dirty), fish, a pig or some sort of reptile without aggravating DH's allergies. I did not want a reptile. I've seen several since and realized I could handle one just fine, but at the time, the idea grossed me out. Another friend went through something similar and was told that if she got a non-shedding dog (Poodles are good) then she could get a dog. Unfortunately, Joe is pretty much terrified of dogs. This has gotten somewhat better as he has gotten older, but the idea of a dog in the house still stresses him. So we were back to the cat thing. As I mentioned in DH's Father's Day tribute, DH will do almost anything for his boyz. So despite his allergies we started to look for a cat. This was all coming to pass during the month of September 2001. Now as any American knows, there was a lot going on and frankly I wasn't paying attention to the passage of time. DH's birthday is two weeks after 9/11 and yep, that was the day we went and actually picked up Misty. Happy Birthday, DH, we got you the pet that will aggravate your allergies the most! On the other hand, we all loved her and she was pretty easy to love. She was very friendly and affectionate. She was lucky to be alive had a hard life before we adopted her (she was missing part of a fang and had a scar on her head where the hair never grew) so even though she had been an outdoor cat, she never tried to get out of our house. She was dumber than a box of rocks wasn't very smart but she was obviously happy to have a safe home and regular meals. She would happily lie on our bed while Alan was jumping up and down a few feet away. We always figured that she just considered him another one of her kittens (albeit a very large one!) and trusted him to not jump on her. And surprisingly he never hurt her. She was noisy! Although she did not appear so, she must have had some Siamese in her because she talked ALL the time. We had to put her in the basement at night because otherwise she would walk through the house meowing at midnight and 3 in the morning. She died in April of 2010 and it was very weird without her. For such a small creature (only about 6 lbs) she certainly left a huge void in our hearts and home. P.S. I updated the name of the blog. 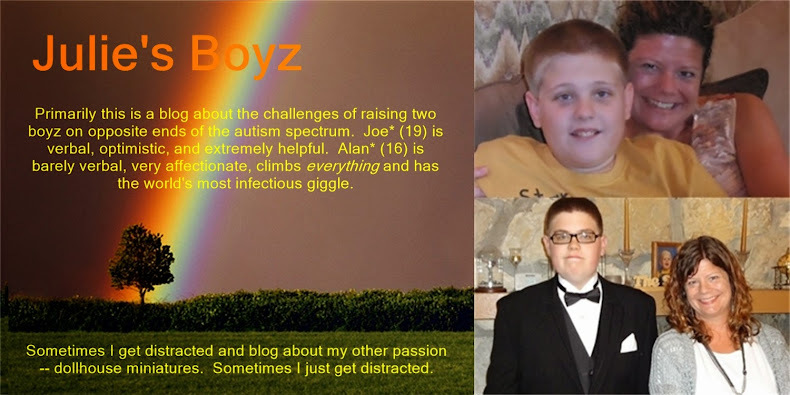 Formerly "Life with the Spectrum" we are now going to be called "Julie's Boyz". Suffering with allergies for your children. What a wonderful dad! So giving! I'm in awe. And sorry for the loss of your cat. It's like losing a family member! He is! It was like losing a family member but next up will be the story of Diesel our current kitty! Such a perfect match your kitty was for you all. I am sure you will always remember her fondly and miss her. God is so good. By the way....love the new name!